One place I was surprised to find to run into Lee and Grant was in Lowell, Massachusetts. 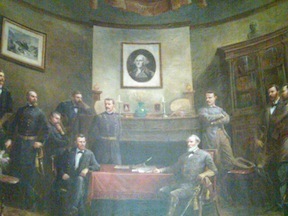 There, their meeting at Appomattox is frozen in time in the main room of the city library, courtesy of artist Paul Philippoteaux, the man who painted the Gettysburg Cyclorama. This entry was posted in Battlefields & Historic Places, Memory and tagged art, Lowell, paintings, Paul Phlippoteaux. Bookmark the permalink.